Give yourself a gift this holiday season and move in to Latham’s first luxury smart apartment homes! Each 1- or 2-bedroom apartment features modern kitchens, quartz counter tops, stainless steel appliances, and a washer and dryer. In addition to the luxurious amenities, Schuyler Commons also offers its residents fully integrated “smart” features. With the Burns Management Smart Home Automation app, you can control door locks, the thermostat, Smart speakers, lighting and more! 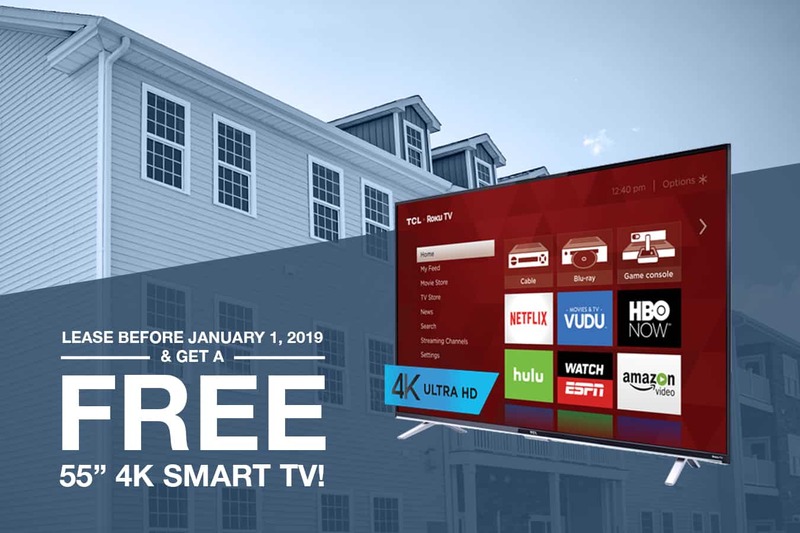 Lease before January 1, 2019 and receive a 55” TCL 4K Ultra HD Smart TV for free! With a 4.3-star rating, nearly 3,000 reviews, and Roku built in, it will be a fantastic addition to your new smart apartment. All Schuyler Commons apartments also have secure gigabyte capacity internet available so you can stream your favorite shows and movies and use multiple devices with ease.